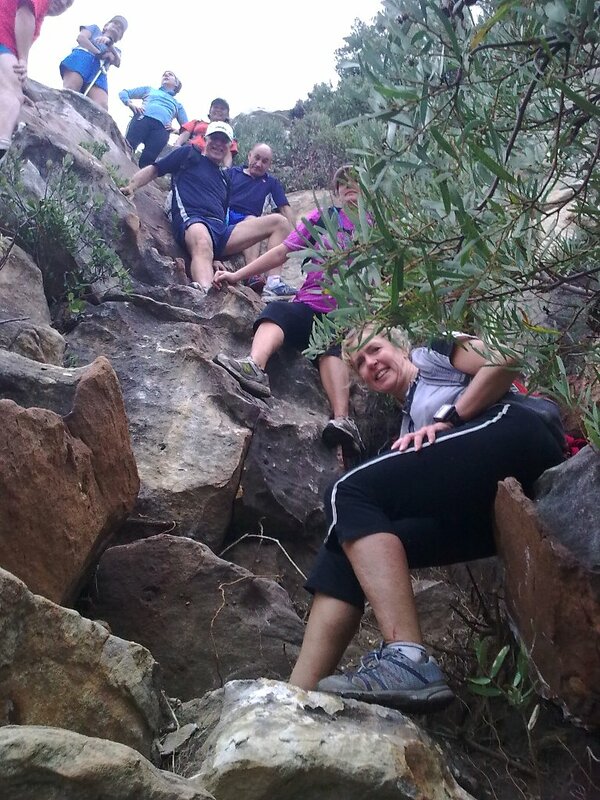 For practical reasons the Walk/Run group were the only Acsis-VOB trail group to venture out this Saturday. 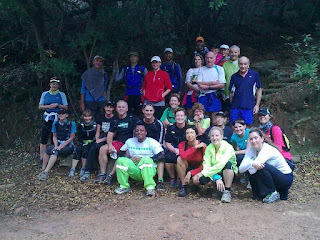 Despite the cold and threatening rain we were joined by many from the other groups so in all 29 of us set out for the run through to Kirstenbosch. 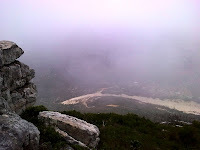 At this point the weather was good and the optimistic thought we might get away and avoid the rain. We followed the lower route and then cut down to the path that runs just above Rhodes Drive to the Cecilia Forest parking area. From the gate we ran down to the Rycroft gate with two lost dogs in tow. These lonely mutts were incarcerated in the toilets at the gate in the hope that their owners would eventually ask after them there. 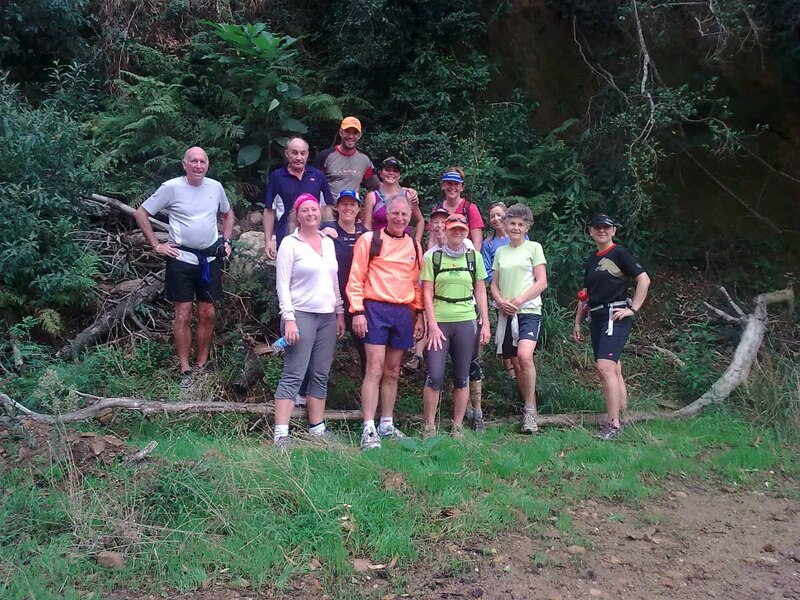 We then took the upper path around the gardens and up Smuts track steps to the foot of Skeleton Gorge where we mustered around the steps for the customary group photo. Thereafter we split with the slower group returning via the contour path and the faster group going onto Fernwood Ravine before turning back. 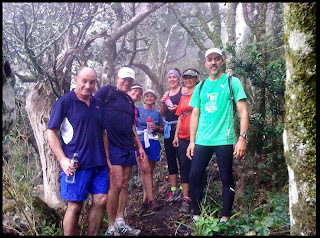 The threatened rain finally caught us on the homewood leg but spirits were high and no-one seemed too put out. All in all an enjoyable run. Fast group covering 12 ks and the slow group 11 ks. This week's Jungle Joe award goes to Pat who decided to get better acquainted with the roots of a passing tree by executing a sideways pirouette with spectacular grace. Later it was noted that a certain male runner bumped into a former girl friend. 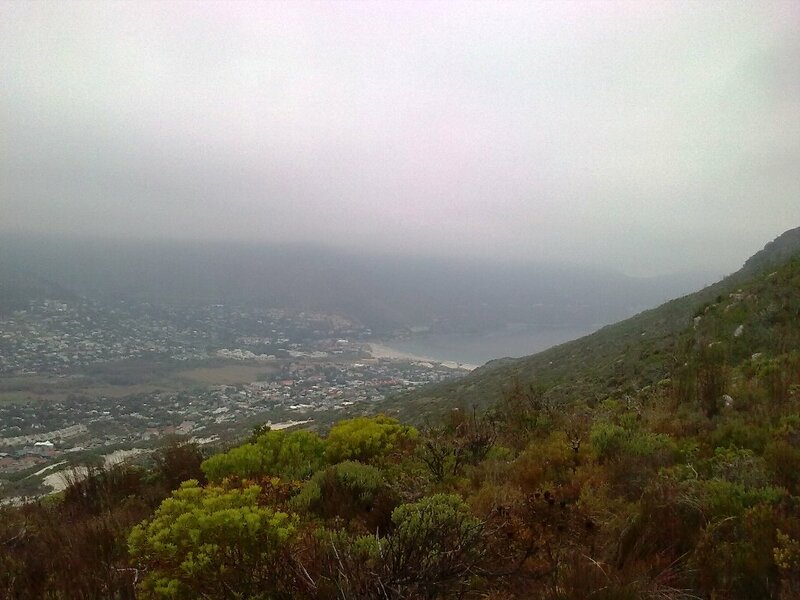 Platteklip and onto the saddle path. 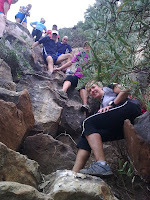 Tim's group was waiting for us as Breakfast rock/saddle rock. 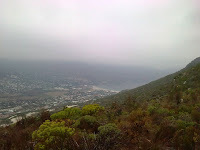 From there we split up and 5 of us continued along towards the blockhouse with Alison leading the way, and came down to Tafelberg road just above the Queen's blockhouse. We then ran the 5 km or so on tar back to the cars. 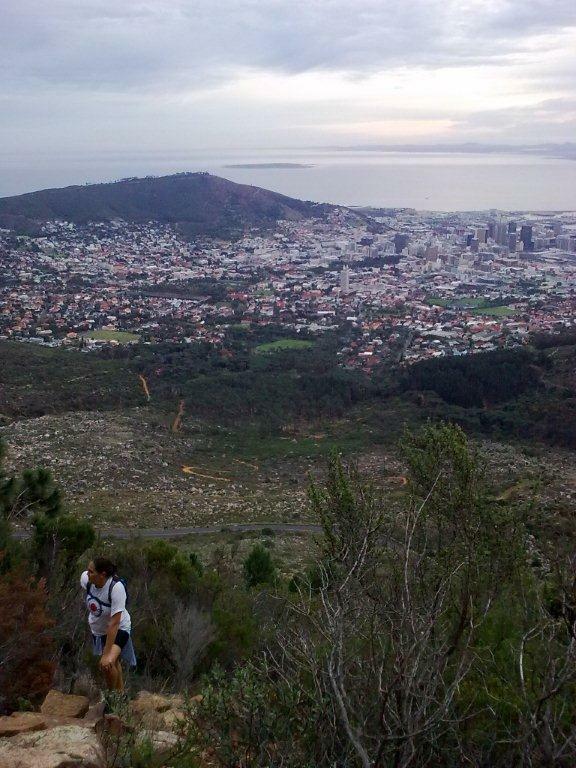 Total run of 12 km". 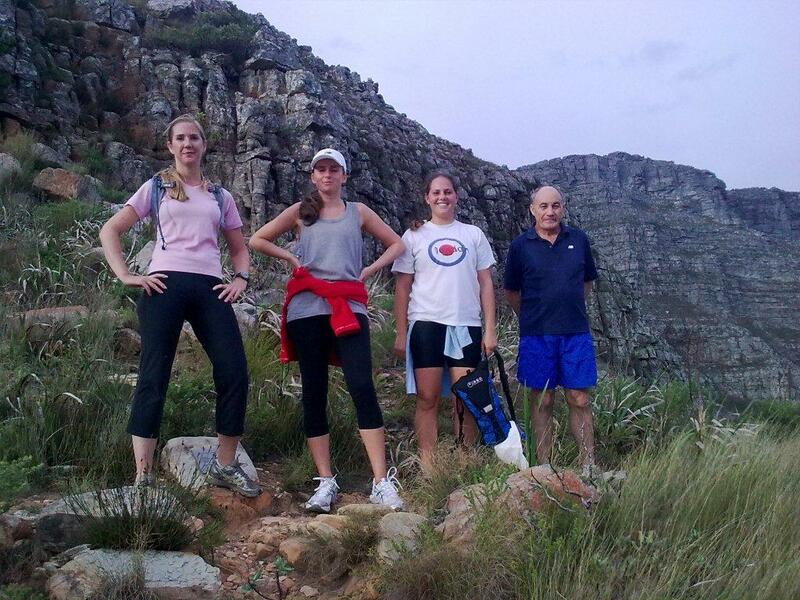 2 new runners -- Chantel and Ashley  - hope they enjoyed themselves and will join us again soon. 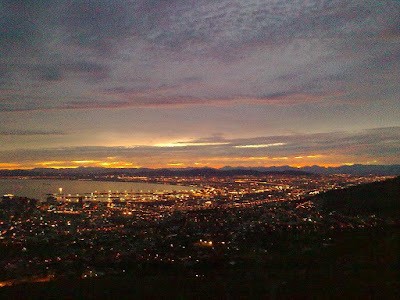 Having never run in this area before, I was a little anxious, but it turned out to be a lovely ‘mixed’ run. 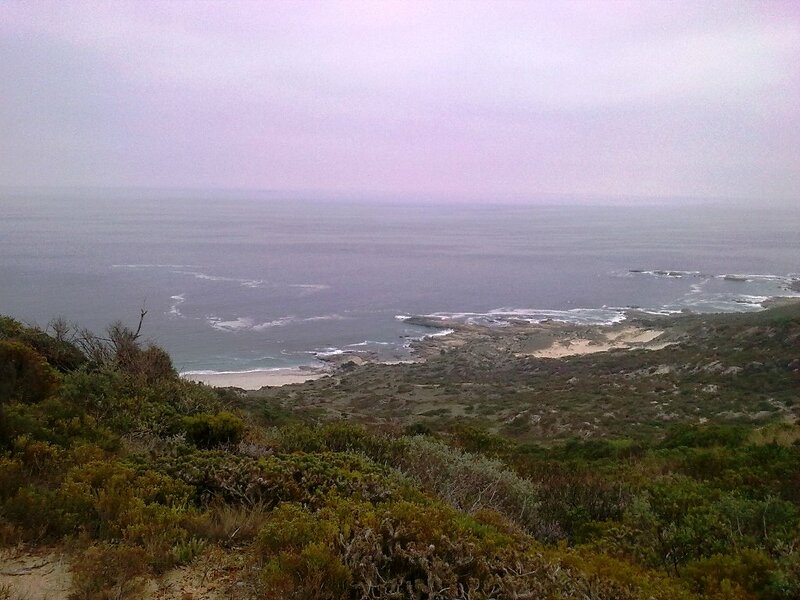 Plenty of walking, single tracks, bushwhacking, rock scrambling, tricky descents, dune running and then some road running at the end. 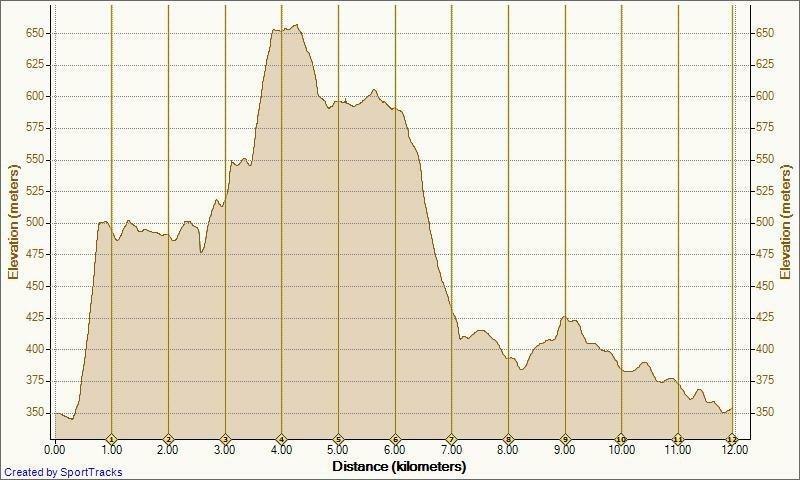 Eight of us decided to stick together, and as you can see from the profile of the route, we just climbed higher and higher and had to do a lot of walking. As I had never done this route before, Tim kindly offered to leave ‘arrows’ on the path so we knew which way to go. Anthony was up front and we were all relieved to find Tim’s arrows often on the path as well as at various intersections and as we were running once again in the mist we could easily have lost our way. The views we did see however were spectacular. 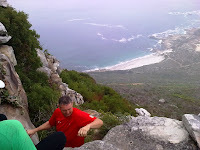 I did have a moment of panic when I saw a steep rocky section down to the Sandy Bay dunes, but Graham had come back for us and thanks to him and the rest of the group, we all managed to negotiate the descent. 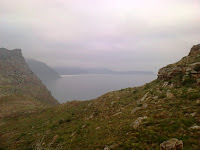 Before long, we were down, and with a short run on the dunes we then stretched the legs on the road back to the harbour. 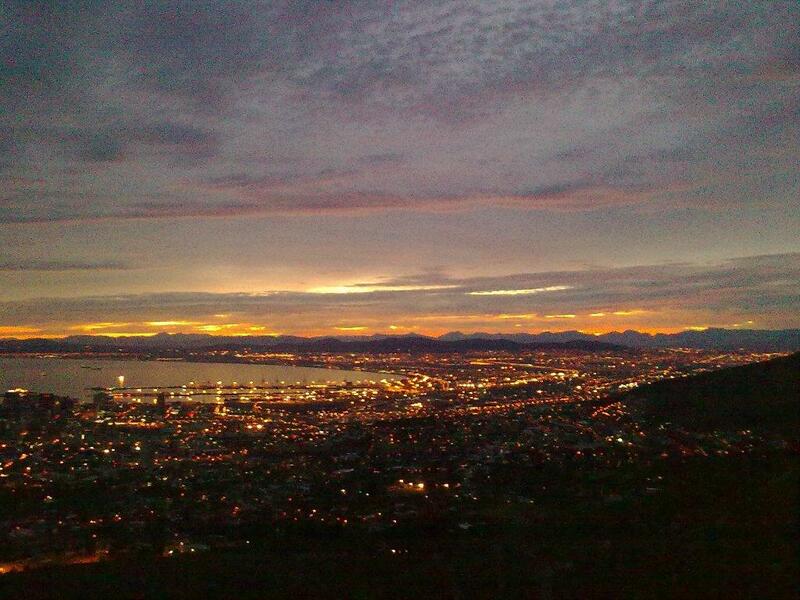 A lovely run of 10.85 km, no missing runners or injuries (as far as I know). From my part, a big thank-you to Gae for standing in and leading the group while Peter and I were out of action. Peter is safely back from his travels and will, I am certain, be back to lead on Saturday coming. Gae reports a lovely run on Saturday. 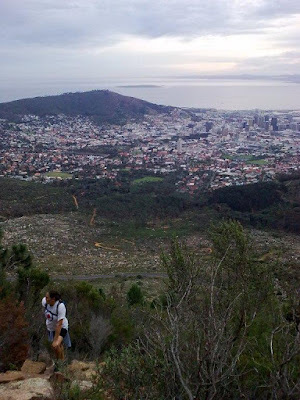 In her words "There were about 14 of us, and we zigzagged up along the contour paths to level 4, made sure we had covered at least 5 km, and then wandered down again, picking up the Elephant’s eye path on the way down. We did 12.2 km in total, no injuries, and no lost runners either. We had a few ‘newbies’ whom I am sure will return." Well I certainly hope so, I see from the photo that last weeks newbies returned as promised. 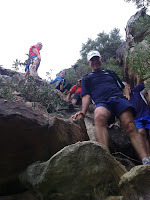 Peter has reported back from his trek, he reached his goal of +- 6000m and is having a fantastic time. Lets hope and pray that he gets back safely. 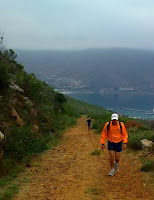 Next weeks run will be Hout Bay Sentinal on the back end of Tim's route. I will scan my maps and work something out between now and then. Please watch the blog for a posting.